Woody plants in Thoreau’s Concord are leafing out earlier with warmer temperatures. All of the species Thoreau observed have advanced their leaf-out dates, and the order of leaf out has not changed since the 1850’s, with plants that leaf out earliest responding the most strongly to temperature changes. This led the Primack lab to question whether- after leafing out early- the trees, shrubs, and vines of Concord will respond differently to an unexpected frost. This spring, we conducted experiments to determine the relative frost tolerance of the young leaves of woody plants in Concord. We collected dormant twigs in the field and brought them into the lab to leaf out, then subjected young leaves of each species to multiple levels of freezing temperatures. We focused our study on 1) the species Thoreau monitored in the 1850’s, 2) selected species at the Arnold Arboretum that leaf out very early and very late, and 3) fifteen birch species at the Arboretum. Stay tuned for the results from these experiments! We clipped and labeled each new twig—this took the combined effort of many helpers, including (from left to right) Luca Russo, Meg Boeni, Jasper Primack, and Sam Roberts. Species from Thoreau’s Concord, like multiflora rose, experienced different amounts of frost damage from different strengths of frost treatment. There were also differences between species within treatments. 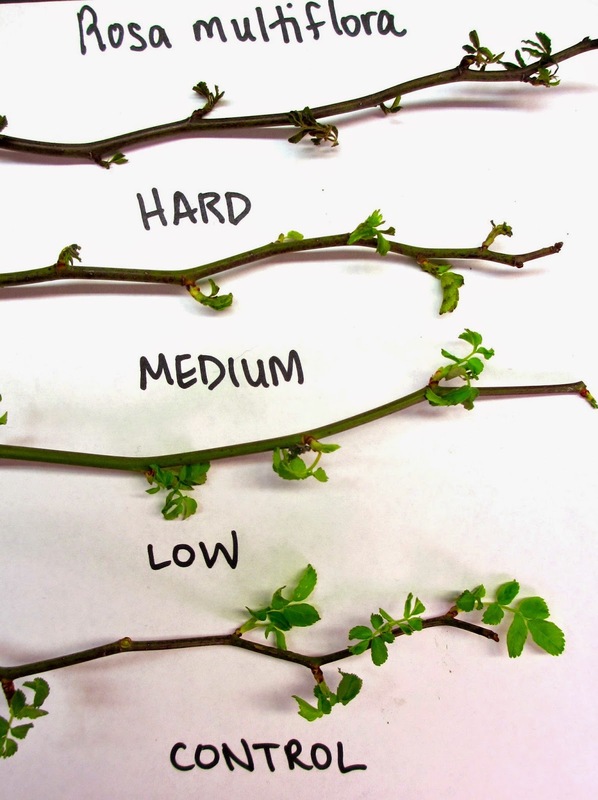 As shown in this photograph, frost damage can be very apparent during a visual assessment.